What are Super Vitachew Soft Chews? Super Vitachew Soft Chews, a delicious chicken-liver flavored soft chew that your dog will love, is the most complete and healthy multivitamin on the market today. Super Vitachew Soft Chews are ideal for all dogs, but are especially beneficial for mature and aging dogs because each tablet is loaded with vitamins, minerals, and antioxidants. It is one of the few multivitamins with no sugar and no preservatives. 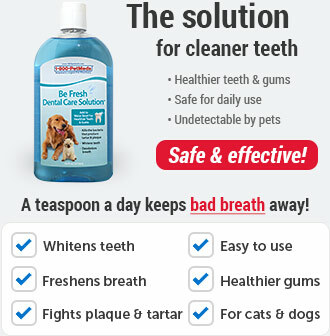 Your pet may also like Super Vitachew Chewable Tablets. Made in the USA. How do Super Vitachew Soft Chews work? Among the ingredients in Super Vitachew Soft Chews are: L-Taurine which supports organ health, L-Glutamine which helps with proper digestion, including better absorption of nutrients and lowering the chances of diarrhea. 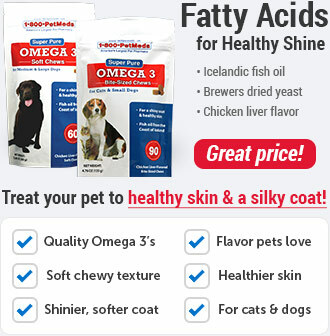 There are also numerous other vitamins, minerals, and antioxidants - a formula benefiting the heart, liver, kidneys, eyes, immune system and coat, assisting in promoting well-being for dogs. Safe use in pregnant pets or pets intended for breeding has not been proven. For pet use only. Keep out of the reach of children and pets. Some pets may consider this a treat. In case of accidental overdose, contact a health professional immediately. May interfere with the uptake of P450 drugs. What is the most important thing I should know about Super Vitachew Soft Chews? 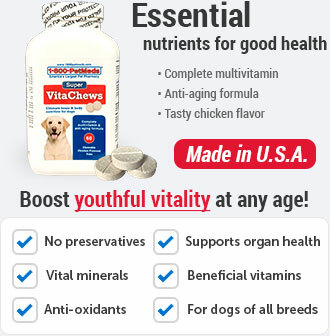 Super Vitachew Soft Chews is the ultimate, complete, multivitamin and anti-aging formula benefiting the heart, liver, kidneys, eyes, immune system and coat. 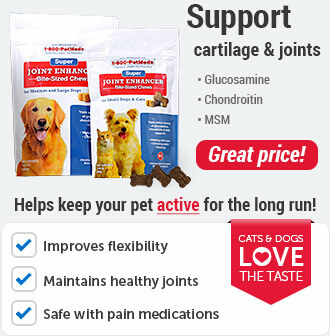 It is highly recommended in promoting well-being for dogs. Super Vitachew Soft Chews is a non-prescription (OTC) product available as chicken liver flavor soft chews. The ingredients are: L-Taurine (200 mg), Calcium (Dicalcium Phosphate and Ca Carbonate) (100 mg), L-Glutamine (50 mg), Magnesium (Magnesium Oxide) (50 mg), Phosphorus (Dicalcium Phosphate) (37.5 mg), N,N-Dimethylglycine (35 mg), Ascorbic Acid (Vitamin C) (25 mg), Choline (Choline Chloride) (15 mg), Lecithin (15 mg), d-alpha Tocopherol Acetate (Vitamin E) (12.5 IU), Milk Thistle Extract (10 mg), Saw Palmetto Extract (10 mg), Betaine HCl (7.5 mg), Thiamine (Vitamin B1) (7.5 mg), Niacinamide (Vitamin B3) (7.5 mg), D-Pantothenic Acid (7.5 mg), Inositol (7.5 mg), L-Methionine (7.5 mg), Eicosapentaenoic Acid (EPA) (7 mg), Alpha Lipoic Acid (5 mg), Coenzyme Q10 (5 mg), Bilberry Extract (5 mg), Proanthocyanidins (from Grape Seed Extract) (4.75 mg), Bromelain (4.5 mg), Docosahexaenoic Acid (DHA) (4.5 mg), Iron (Iron Proteinate) (4.5 mg), Linoleic Acid (3.75 mg), Riboflavin (Vitamin B2) (3.75 mg), Pyridoxine HCl (Vitamin B6) (3.75 mg), Para-aminobenzoic Acid (PABA) (3.75 mg), Retinol Palmitate (Vitamin A) (900 IU), Zinc (Zinc Proteinate) (1.5 mg), Manganese (Manganese Proteinate) (1 mg), Protease (0.48 mg), Cholecalciferol (Vitamin D3) (75 IU), Potassium (Potassium Citrate) (0.375 mg), Iodine (Calcium Iodate) (0.06 mg), Cobalt (Cobalt Proteinate) (0.06 mg), Lipase (0.04 mg), Chromium (Chromium Picolinate) (0.00525 mg), Selenium (Sodium Selenite) (0.00525 mg), Copper (Copper Gluconate) (0.0045 mg), Folic Acid (0.003 mg), Biotin (0.003 mg), Cyanocobalamin (Vitamin B12) (0.003 mg), Pepsin (0.0025 mg). 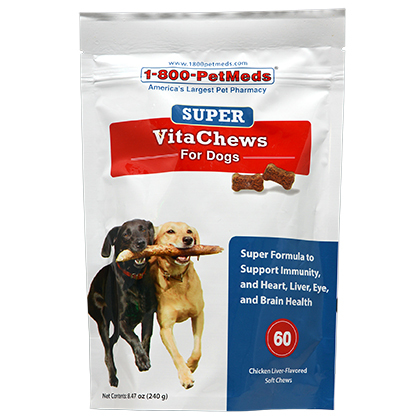 What should I discuss with my veterinarian before giving Super Vitachew Soft Chews to my pet? This product is for pet use only. 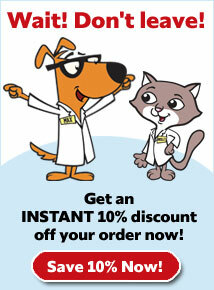 Tell your veterinarian or pharmacist about any medications your pet may be taking. How should Super Vitachew Soft Chews be given? For dogs under 20 lbs give 1 chew daily. For dogs 20-70 lbs give 2 chews daily and for dogs over 70 lbs give 3 chews daily. If giving more than 1 chew divide between AM and PM. What are the potential side effects of Super Vitachew Soft Chews? Safe use in pregnant pets or pets intended for breeding has not been proven. 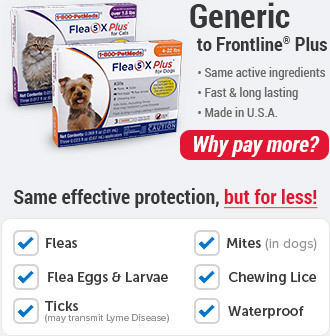 If your pet's condition worsens or does not improve, stop product administration and consult your veterinarian. What happens if I miss giving a dose of Super Vitachew Soft Chews? Resume the normal dosing schedule as soon as you remember to give the next dose. Do not double dose. What happens if I overdose my pet on Super Vitachew Soft Chews? What other drugs will affect Super Vitachew Soft Chews? This product may interfere with the uptake of drugs metabolized in the liver (P450 drugs). 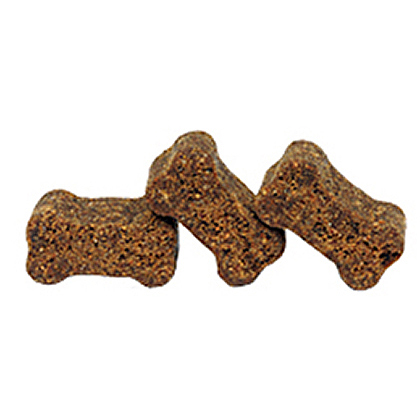 Super Vitachew Soft Chews are chicken liver-flavored soft chews highly recommended in promoting well-being for dogs. Super Vitachew Soft Chews are for dogs only. Do not give to cats. Super Vitachew Soft Chews are ideal for all dogs, but is especially beneficial for mature and aging dogs because they are loaded with vitamins, minerals, and antioxidants. Ingredients: Arabic gum, brewers yeast, calcium sulfate, canola oil, carrot powder, chicken liver flavor, citric acid, citrus pectin, fish oil concentrate, glycerin, maltodextrin, mixed tocopherols, oat flour, oat meal, propionic acid, rye flour, rosemary extract, safflower oil, silicon dioxide, sodium alginate, sorbic acid, soy lecithin, vegetable oil, water.